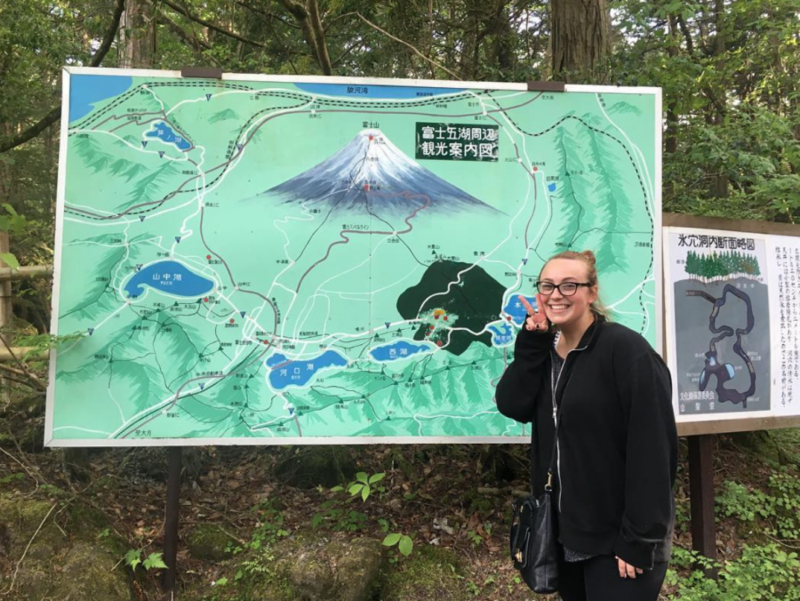 Photo of Stephanie hiking Mount Fuji in Japan. Senior student Stephanie Teresi had only four months to record and one week to edit and finalize a five-minute film showcasing water pollution for One Earth’s Young Filmmakers Contest. “The World of Convenience: Plastic Bottles” didn’t win first prize, but it was premiered during the One Earth Film Festival in NEIU’s Alumni Hall on March 6. “The World of Convenience: Plastic Bottles” starts by addressing the beauty and power of Earth’s water. Immediately afterward, the short film showcases how water pollution is affecting the earth using statistics. The film’s ending aims to encourage others to make some positive, eco-friendly adjustments in their lives. Teresi said little changes people can make are buying metal straws instead of plastic ones and bringing their own shopping bags. Most of the footage Teresi used for her film were clips that she already had on her iPhone. After compiling all of the footage she wanted to use, she used iMovie to cut and edit the film. Teresi grew up in Park Ridge, Illinois and has been in love with filming for most of her life. She couldn’t recall the moment when she decided to start filming, the desire was just embedded in her. It was during her time at Maine South High School that Teresi began filming documentaries with her friends. Most of the documentaries focused on nature, documenting her travel experiences with informative aspects. The first completed and edited film that Teresi finished was for NEIU’s Belize study abroad program last year. The documentary juxtaposes Belize’s tourism and beauty with the poor waste and land management, and illegal hunting and fishing. During her time in Belize, Teresi and other NEIU students participated in a river clean up. They filled three kayaks with littered plastic from the river that connects directly to the ocean. Teresi has traveled to several places in the United States, Ireland, Japan, Italy, Belize and Spain. She does not have an online portfolio of her documentaries but maintains a travel Instagram instead: @leaving_the_nest286. She hopes to make her own YouTube page to post her future docuseries focusing on the world and plastic, elaborating on “The World of Convenience” topic. After graduation, she hopes to work with conservation, specifically marine life and finding ways to clean the ocean. She is double majoring in environmental studies and geography. The One Earth Film Festival showcasing Teresi’s film and Filmmaker Cyrus Sutton’s “Island Earth” was sponsored by NEIU’s Green Fee Committee and the department of geography and environmental studies.